I think it’s true that both humans and dogs both have food issues. I mean… my dogs are in good shape. They are not fat, they are not skinny. They get enough to eat, but they sure don’t think so. If it were up to them, they’d all be super fat and happy eating all day long. And you know, it’s the same for me too. LOL. Though I’d add to that: sitting around on the couch all day would be ideal instead of running amok all over the place like the dogs like to do. I guess when I was lots younger I liked to run around too. But now I’m like the older dogs, content to sit and veg. It’s good that I do have some younger dogs to keep me on me feet and moving. And I do move! I’m thinking, instead of jogging, I need to go sprinting. Since most of my dog sports where I’m moving are agility or flyball, where I’m sprinting full speed for only a half a minute or so. Maybe I’ll try to do that when I’m out with the dogs. Just take off full speed for 30 seconds and see if that helps. LOL. Anyway, so I’m going to write down everything I eat… I think that’s the best way for me to lose weight. I hate it. My anxiety surfaces when I have to track something like that with OCD. It’s why I don’t clean well or cook well. Same anxiety. But alas, I’m getting too big. And the only thing that has really worked for me in the last year has been when I’ve counted calories and written down everything. Bleh. And I need a long term goal, like a year. I guess I can’t expect to lose 10 pounds in a month. Even though that’s what I want. I’m now past 40, and yup, it’s much harder to lose weight now. Ugh. Oh well, so me and the dogs hopefully won’t be sticking our heads in the dishwasher trying to lick out every dang crumb. LOL. If I get to that point, then please put me in therapy! What a cute picture. Our dogs would do that too, if they could fit in the dishwasher! Good luck with your goal. Baby carrots and fat free popcorn, get me through the night time munchies! I’ve been doing the same thing, but started a running program with the end goal of running a 10K, and possibly going on to do a half marathon if I still like running at that point. Cottage cheese and frozen fruit is great for bringing places, as the fruit will thaw slowly and not be frozen when you go to eat it, but will keep the cottage cheese cold. And Almonds with various dried fruit is super tasty and high in protein (same with the cottage cheese, but then, I have issues getting enough protein sometimes). My Maya and Becky’s Ky would be fat fat fat if it were up to them for sure! 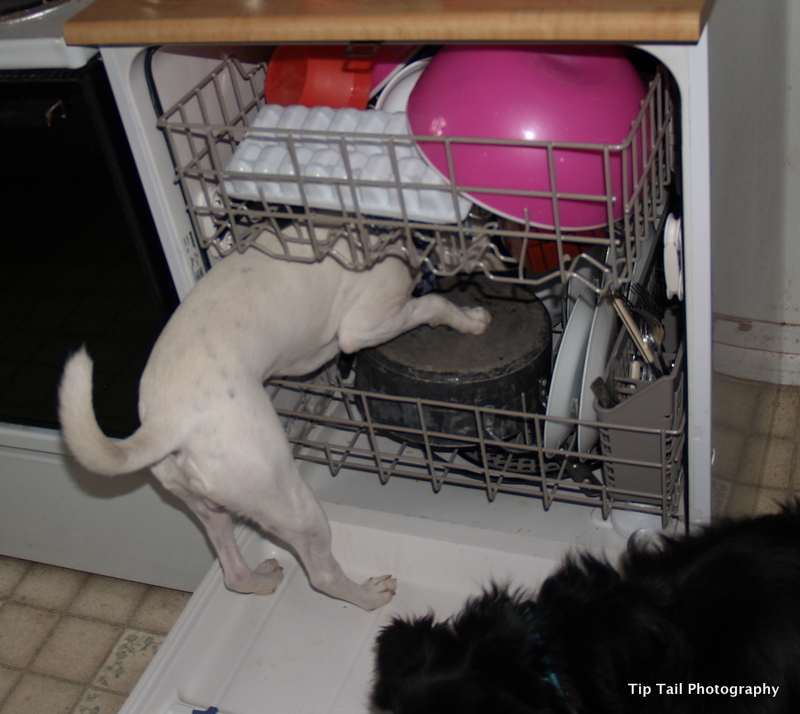 Sadie loves it when Daddy loads the dishwasher. I just need someone that controls my food and makes good decisions for me, LOL, I feel like I do a good job of that for my dogs but so much harder for myself. I think the journaling food is a great idea, you sure see what is going on that way. Love the picture of Jet. I hope my 180-pound Rottweiler won’t be doing this shenanigan soon. I just don’t know why dogs are afraid of the vacuum cleaner but dishwashers attract them like moth to flame.